1. RobotC中，從方位址一定會平移一個bit， 因為從方位址有7 個bits 長，bit 0..bit 6 (從0…127). RobotC 和Lego NXT 使用 8 bits coding, 但是 EV3 和 Arduino 使用7-bit位址coding. // How to send data from the LEGO Mindstorms NXT/EV3 to the Arduino. // See www.dexterindustries.com/howto for more information on the physical setup. // When data is received from NXT/EV3, this function is called. · Sensor 2 (Ultrasonic Sensor):這個模組需要連到任意兩個數位腳位 “trig” 和“echo”，假設連到數位腳位 7 and 8. 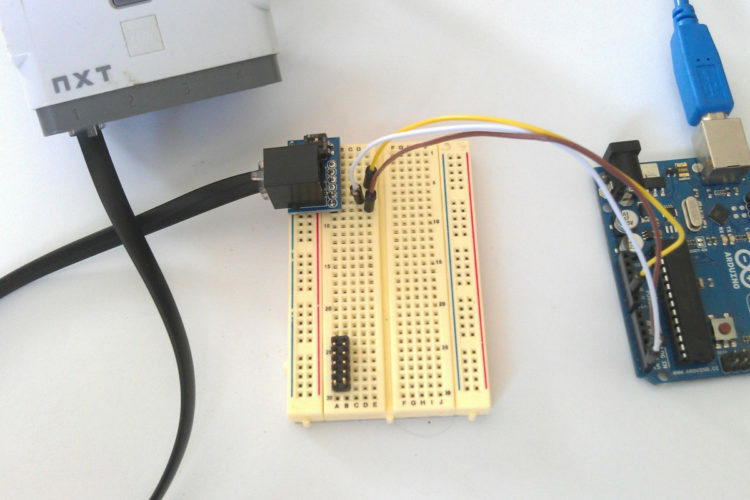 This entry was posted in Arduino嵌入式開發板 and tagged arduino, ev3, nxt, 改裝.